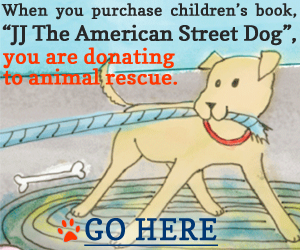 Ready to adopt one of our dogs? Start by filling out our online application. Our Super Cool Art Stencil Contest is ON! We’ve received our first two entries and we have been told that more are on their way. For all the contest details, visit our website. On Friday’s we’ll recap the week’s entries on our blog. You can also view the entries as they come in on Twitter, Pinterest and Instagram. We’re using #CHRstencil. Get Your Creative On and you could win a $50 gift card to the restaurant/store of your choice. Runner-Up gets a $25 gift card. We bought a chair at an estate sale. The owner could not take the chair due to housing concerns. We believe the chair is part Chippendale, part arts & crafts and part Shaker. We decided to foster this chair. We gave it a good grooming and made it a comfortable cushion (note: this is the first time we’ve sewn anything). We used the CHR stencils to jazz it up. The chair would fit in any household but it can’t be left outside! We would like to donate this chair to CHR and hopefully it can find its furever home! We had so much fun remaking and fostering this chair! The chair’s name is Blue! GAME ON! Join in the fun and show us your creative side! As summer comes to a close, it’s nice to be a relaxed dog in a chair. Here’s hoping your weekend is just as peaceful.